Our customary Friday foray into weirdness takes us to the World Economic Forum’s annual shindig in Davos, Switzerland. 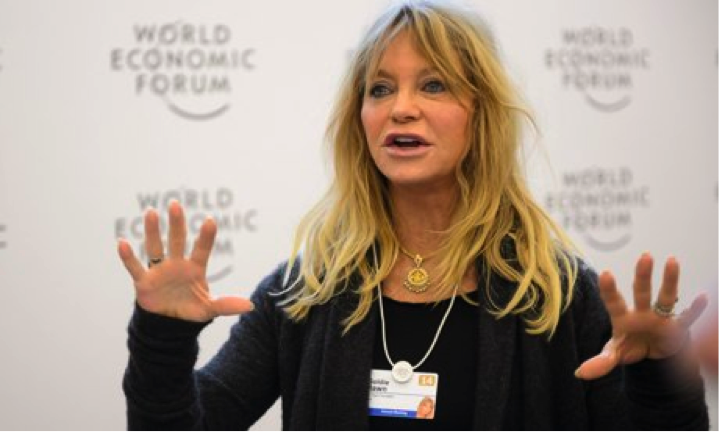 One of the big sessions yesterday featured the actress Goldie Hawn extolling the benefits of meditation as a stress-buster. Among the global elite gathered in Davos, “there’s maybe a greater recognition that the levels of stress of the last five years are not going to go away,” says WEF chief business officer Robert Greenhill. Memo to the Davos crowd, world improvers every one of them: Meditate all you want, but you’ll never find inner peace until you let go. Give up the illusion that you’re capable of tweaking events to your liking — preventing bankruptcies and civil wars and bad weather and dandruff. Tend your own garden; others can easily take care of their own. Likewise gold: It’s up again today, to $1,268. The narrative most of the financial media have latched onto this morning is emerging-market currencies: They’ve gotten whacked two days in a row, starting with the Argentine peso. Argentina’s penchant for crisis every decade or so is returning more or less on schedule. 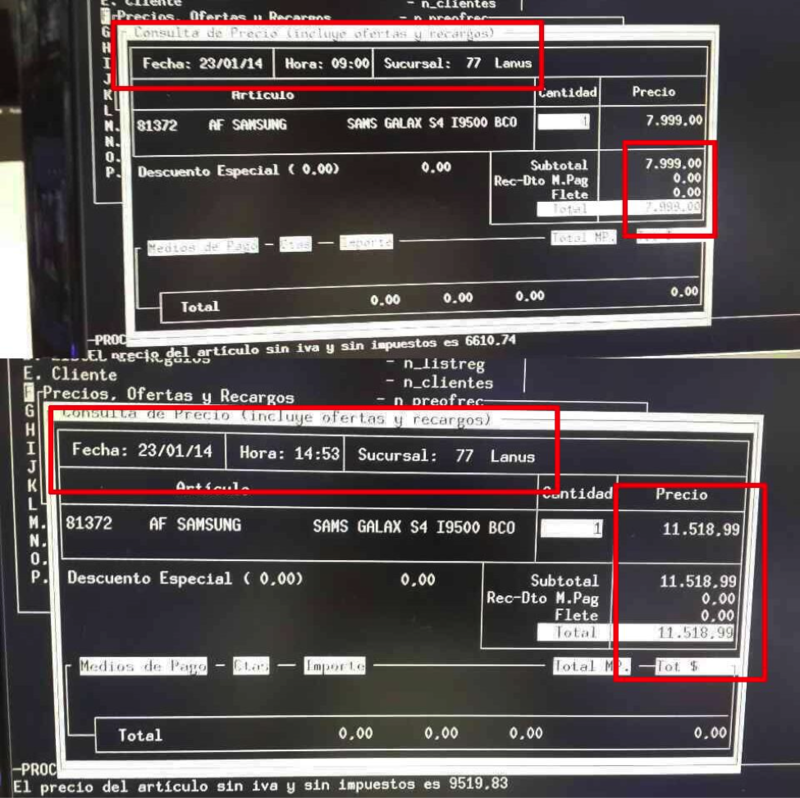 Someone on Reddit noticed the cost of a Galaxy S4 smartphone leaping yesterday from 7,999 pesos to 11,518 in a mere six hours. On New Year’s Day, the black-market exchange rate between the peso and the dollar — the “blue dollar,” they call it — was $10. This morning, it’s up to $13.10. Yes, that’s an unsatisfying answer. It’s why “Gunner” will never be invited on CNBC. He doesn’t look for clean narratives — for instance, the Argentine peso — to explain market moves. He’d rather make money — which is why he’s a trend follower. Trend followers apply some of the tools of technical analysis — the study of chart patterns — but they do not try to predict what “the market” or any particular asset will do. They make no attempt to identify the “top” or “bottom” of a market before it happens — or even as it’s happening. Only after an identifiable bottom is it time to buy. Only after an identifiable top is it time to sell. Using those techniques, Greg spotted trouble in gold as early as last February when it broke below $1,650. By mid-June, he was calling a short-term target of $1,200-1,250 — which played out before month’s end. But if you want to know whether a correction in stocks is underway now — sorry, the verdict isn’t in yet. Beware anyone who says otherwise. 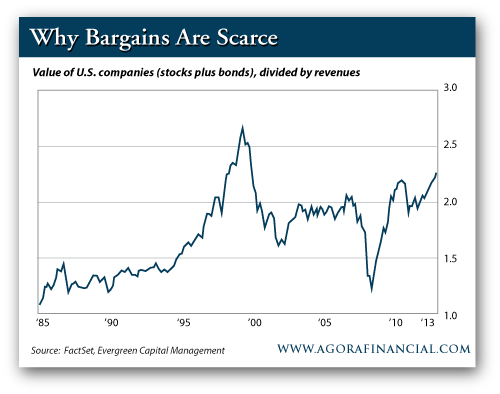 “Is the stock market expensive or isn’t it?” asks our Chris Mayer. Evidently, our editors are fond of posing rhetorical questions today. For what it’s worth, Chris finds the question irrelevant. He’s on the prowl for bargain-priced stocks — and, in his high-end service, stocks that have a near-term catalyst. “But since it is getting harder and harder to find bargains,” he says, “it may help to understand why that is. An analogy might help: “Say you have a house worth $250,000. On this house, you have a mortgage of $200,000. You have ‘equity’ of $50,000 in the house. Now, let me ask you: What’s your house worth? “The correct answer is $250,000. 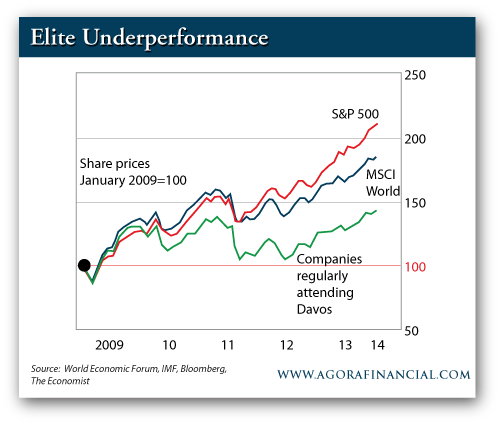 Feast on this chart from David Hay at Evergreen Capital Management. “What Hay’s chart shows is that the market currently values a dollar of sales at really high levels. The result may be the same as a price-earnings ratio, but using enterprise value is theoretically sound. “It’s a target-rich environment for energy investors,” says our Byron King, who counts energy among his specialties. 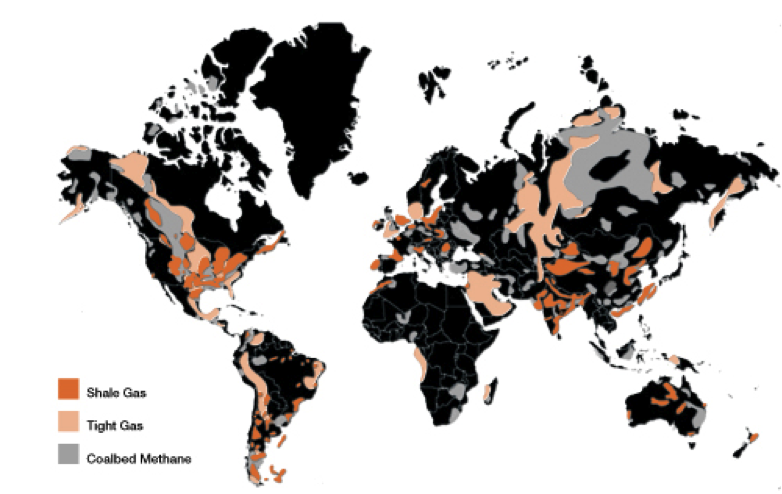 Basically, there’s “unconventional” gas to be had anywhere on the map that’s not in black. And so is this: access to all of Byron’s research across energy, mining and military technology. Plus, the fruits of Chris’ relentless search for bargains. And Greg’s daily trading guidance. Plus, 12 more research services. We have a handful of “package deals” here at Agora Financial. But only once or twice a year do we offer our most comprehensive suite: the Agora Financial Reserve, limited to only 1% of our readership. And you get access to every new service we’ll publish in the future — including one geared to imminent government approvals of new drugs, the sort of decisions that can multiply a stock’s price threefold in a single day. If you subscribed to these services separately, it would cost you $18,994 in just the first year. But as a Reserve member, you pay a fraction of that total — once. For a comprehensive review of the privileges that come with membership, please review this presentation from our publisher Joe Schriefer. And thank you. “What, may I ask, is so wrong with the Canadian health care system?” a reader writes from the Yukon after yesterday’s item about Obamacare. “The U.S. spends about 17% of GDP on health; we, about 10.5%, but with far better outcomes, owing to prevention, early interventions, follow-ups and the simple single-payer system. Interestingly, the Doctors who originally went on strike to oppose it 50 years ago wouldn’t trade it now. Why? No accounts receivable. “Yes, we pay higher taxes, and yes, there are wait times, but yikes, how can you beat free insurance coverage? In short, you wait or you pay, you choose your own doctor or your HMO does, supported by an army of clerks. Plus, our drug prices are much cheaper and, in my case, free as a senior. Believe me, I’m no socialist, but (hey, there had to be a ‘but’) I think we have made better choices on health care. “I’m from Canada and left that country because of the socialist regime,” writes another reader. “I know that the Canadian health system is in a shambles and will be forever. “I have family that are awaiting needed surgeries and can’t get them because insurance ‘quotas’ have been met this month for knee replacements, hip replacements, etc. Too bad for you… wait another month (or five or six). We’ll give you more pain meds to tide you over until we can get to you (conveniently supporting Big Pharma, do you think?). “My husband and I were married with no kids… and subject to an income tax of 35% off the top, followed by the additional goods and services tax — resulting in an additional 10-17% tax. So much for ‘free’ health care. I lived it for 35-plus years… nothing is free! Let’s hope it doesn’t get to that… but bloated government officials have never been known to do the right thing. “The only fair thing would be to put all political leaders on the same health ‘insurance’ plan they want the rest of us saps to get. I don’t think this experiment would last long if they were forced to endure what we’re expected to. 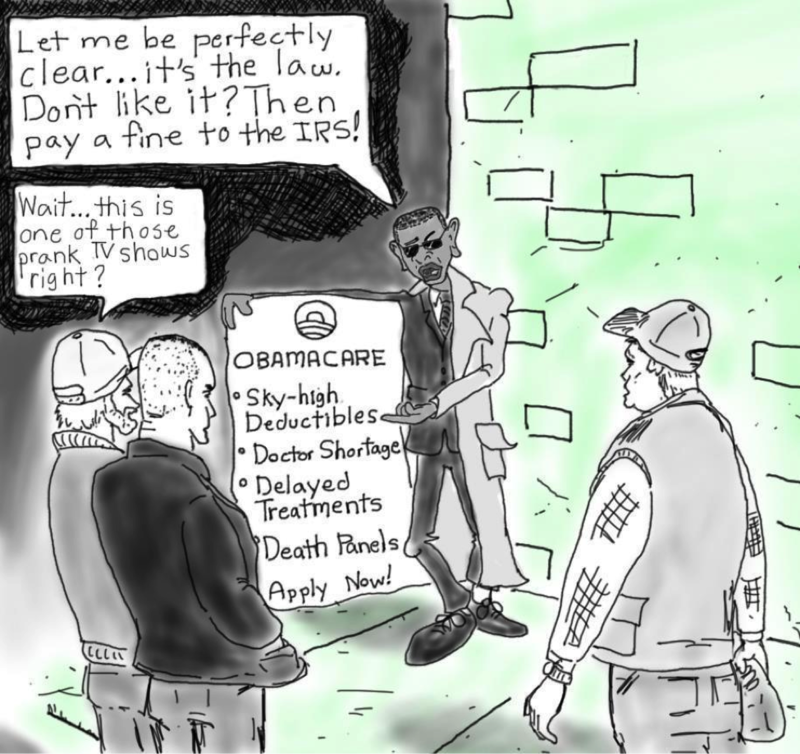 “Your teaser line is false and misleading!” a reader objects to the Laissez Faire Club’s solution set for Obamacare. “The report itself contains this heading for Chapter 2: ‘The three words that allows [sic] you to opt out of the worst parts of Obamacare.’ [With your solution,] the insurance policy is still subject to the rules of the ACA, so there is no way to completely avoid Obamacare (other than via certain limited exceptions built into the law). “And while this report was not intended to get into all the details of the ACA, there should have been some mention of the fact that many people will get high levels of coverage for a very low insurance cost (lower than a Bronze HSA) if their modified adjusted gross income is less than 250% of the federal poverty level for their family size. The 5: “False and misleading?” replies Club director Doug Hill. “Ummm, we never say ‘completely avoid Obamacare’ anywhere in our report. “As you point out, the ACA is here to stay. We merely show the initiated reader how to avoid the worst parts of Obamacare. You know, stuff like a lack of choice when choosing your plan, higher deductibles and premiums skyrocketing as much as 305% for some people. “Then as time wears on and more doctors leave the subsidized industry, wait times will increase, prices will rise more and choices will be limited further. “Of course, I am assuming access to quality care is important to you. “And while you are correct people can qualify for subsidies and lower premiums, why should we write about that? We don’t want to step on the president’s turf. P.S. That Davos crowd: They think they’ve got everything figured out. Climate change? Nothing a carbon tax can’t fix. The world improvers (an exquisite term coined by Agora Inc. founder Bill Bonner) never rest. But neither do we when it comes to finding comprehensive solutions to everything from Obamacare to NSA spying to run-of-the-mill income taxes. Stand up for your liberty, starting now, starting here.